So far to date, only one legal effort has been measurably effective in hindering the relentless determination of Gov. Jerry Brown and the California High-Speed Rail Authority to proceed with construction of bullet train tracks through the San Joaquin Valley. 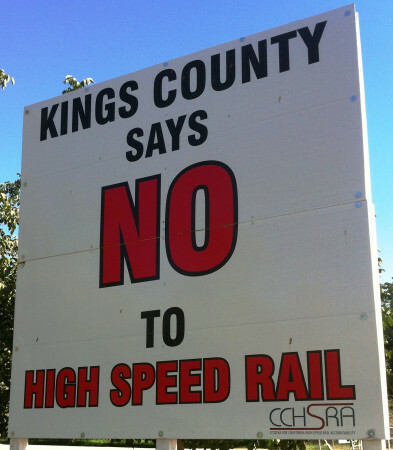 Tos, Fukuda, and County of Kings v. California High-Speed Rail Authority – asserting in a lawsuit that the California High-Speed Rail Authority failed to comply with requirements of Proposition 1A (2008). High-Speed Rail Authority et al. v. All Persons Interested, et al. – asserting as a respondent in a so-called “validation” lawsuit initiated by the California High-Speed Rail Authority that it has not met the requirements to sell bonds as authorized by Proposition 1A (2008). In 2013 Kings County farmers and their allies won preliminary victories in Sacramento County Superior Court. Those decisions were overturned by an appeals court in 2014. In 2015, the courts will continue to evaluate what the California High-Speed Rail Authority needs to do to comply with Prop 1A. Challengers to the California High-Speed Rail Authority generally need to fund their litigation through fundraising, while the California High-Speed Rail Authority can fund its legal activities by simply dipping into funds provided by taxpayers. Citizens for California High Speed Rail Accountability (CCHSRA) has a large and active board of directors and a procedure for accountability in its receipts and expenditures. It has coalition allies who can vouch for its responsible management of funds and the honesty of its leadership. Please help us with our legal expenses as we make the California High-Speed Rail Authority accountable to the public for its planning, spending, and actions. Do you have questions about how CCHSRA will spend your money? Email us, please!